Prove whether connection issues are caused by local networks, the service you're accessing, or something in between. Step by step instructions and an overview of PingPlotter's capabilities. Purchase perpetual licenses or monthly subscriptions. Step by step instructions and an overview of MultiPing's capabilities. Purchase single or multi user licenses. Dozens of articles on everything from product instructions to network troubleshooting concepts. Step-by-instructions on how to diagnose network problems and work toward a solution. Why do the red "packet loss" lines have different vertical heights on the graph? Each "pixel" in the time-graph is comprised of anywhere from 1 to many samples. When you're looking at 5 minutes of data in a Timeline Graph, any sample will be multiple pixels wide (because the number of samples being displayed is limited). 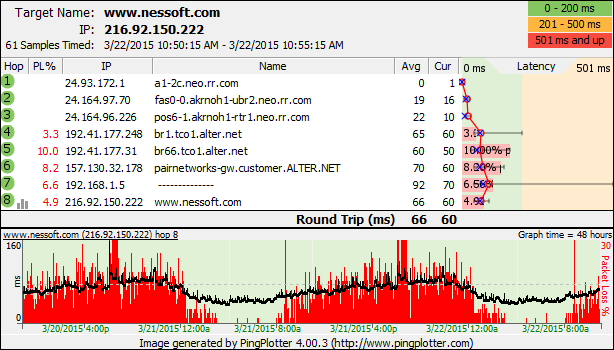 In this case, a lost packet will show 100% packet loss on the graph, and the red period will be multiple pixels wide. Now, sometimes you might have each pixel representing 8 samples (or maybe 4, or some similar small non-one number). This will happen if you're looking at one hour of data when the sample interval is 1 second and the width of the graph is 450 pixels. In this case, if one packet was lost, you'll see a jump in red-height of a fixed amount. Another lost packet will make it jump up another "chunk". As you look across a Timeline Graph like this, you'll see a number of red bars of equal height (1 lost sample out of 8, say), and a number of red bars of somewhat taller height (2 lost samples out of 8). These are kind of "plateaus" that seem to generally be hit - that's because we only lose packets in whole number increments. As you increase the amount of data you see at a time, the more smooth these packet loss lines get - and the more "trending" you'll see in packet loss data. These same concepts with packet loss graph heights also apply to latency averages. If a single pixel width represents 20 packets, then the height of the bar in that pixel is an average (mean) of the latencies. If a single sample of that 20 is high, it will slightly increase the pixel height, but won't make it as tall as the maximum sample during that period. This means that the scale of the upper graph (which can graph minimum, maximum and averages) might be different than the scale of the graph on the bottom (which is graphing as much detail as it can, but might have to average some numbers to make it all fit). This actually works very well to see trending (since an individually high sample isn't very meaningful when you're looking at 50,000+ samples ) but can be slightly confusing when you first see this happening. The graph above shows a perfect example of how this averaging is helpful - you get to see packet loss trends over time. Long term monitoring and auto-saving of data. We can help with a step-by-step roadmap to network nirvana. Copyright 1998-2019 Pingman Tools, LLC.